Pam Lefors new Live, Love, Laugh Kit. Goodness - I'd forgotten there were teddies on that CD. Will have to revisit that one soon methinks. A gorgeous card Caroline. 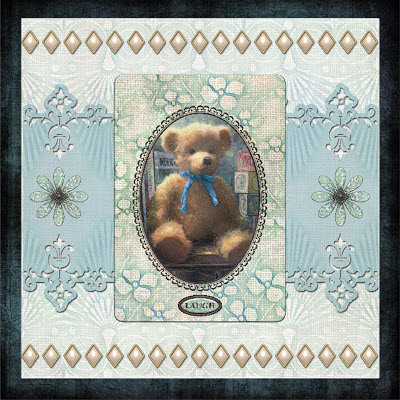 A beautiful card Caroline and a stunning little bear. Love the colours and the layout. Thanks for joining us at CD Sunday this week. Fabulous Caroline, beautiful teddy and i'm loving the look of that kit. Thank you for joining us at Cd Sunday. What a lovely traditional teddy. I love the borders you have used. What a sweet image and a great layout.